Jan - 16 | By: Oregon Film | 4 comments. 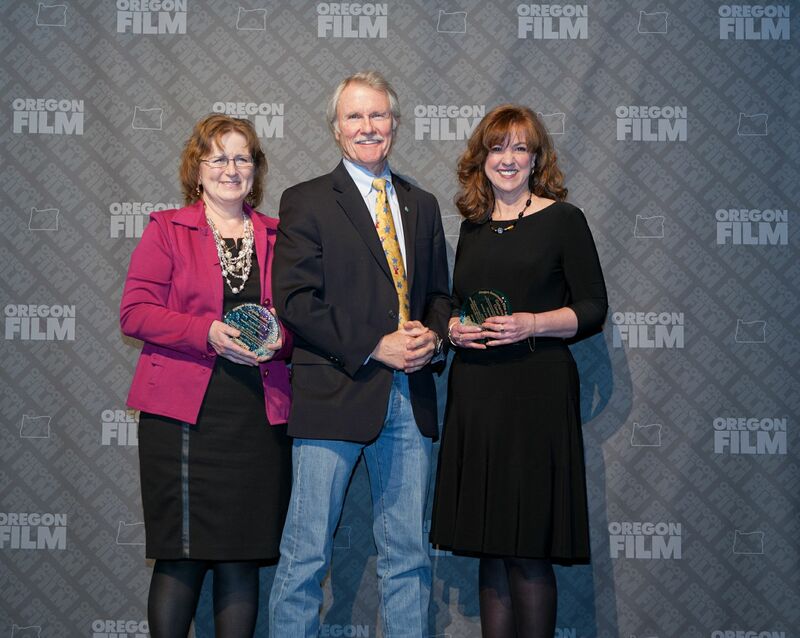 At Oregon Film & Television’s Annual Meeting last night, Dean Devlin (Producer, Leverage) and Governor Kitzhaber presented Film Advocate Awards to Catherine Comer and Jamie Johnk from Clackamas County Business and Economic Development. Catherine, (Business & Economic Development Manager) and Jamie (Economic Development Coordinator) represent a “best case” example of the cooperation between the needs of the film and media production industry and the community at large. Often the needs of production temporarily inconvenience the public, but instead of seeing these instances as having a negative impact, Catherine and Jamie see them as opportunities. They understand that to facilitate production is to bring revenue and economic development to their county. Together they put together a comprehensive filming initiative for Clackamas that includes projects such as; a model filming ordinance, high speed fiber optic access, a database of properties and businesses available for filming, forged partnerships between Clackamas Community College and the production community to create educational and occupational opportunities and helped to raise awareness with the County Tourism and Cultural Affairs representatives about the opportunities that projects such as “Twilight,” “Leverage” and “Grimm” provide to promote Clackamas County. Thank you Clackamas County for being positive film and TV advocates! LOVE DEAN DEVLIN and LOVE MY LEVERAGE !! THANK YOU FOR SHARING THIS! Dean Devlin & Company including TNT, have injected millions into the economic bloodstream of NW Oregon. We gotta stay friends with these folks. So nice to see Dean Devlin being recognized for his work on Leverage!